Purpose: Use this document as a referencefor building summary ledgers in ctcLink. 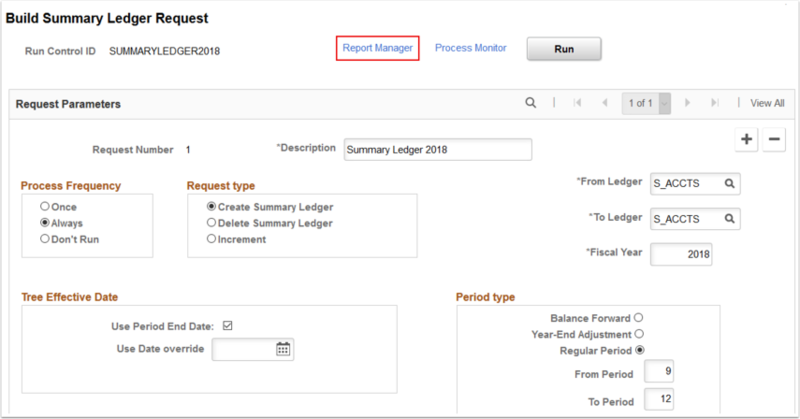 After completing ledger entries, you can build summary ledger balances according to the definition of the summary ledger and the requested parameters. 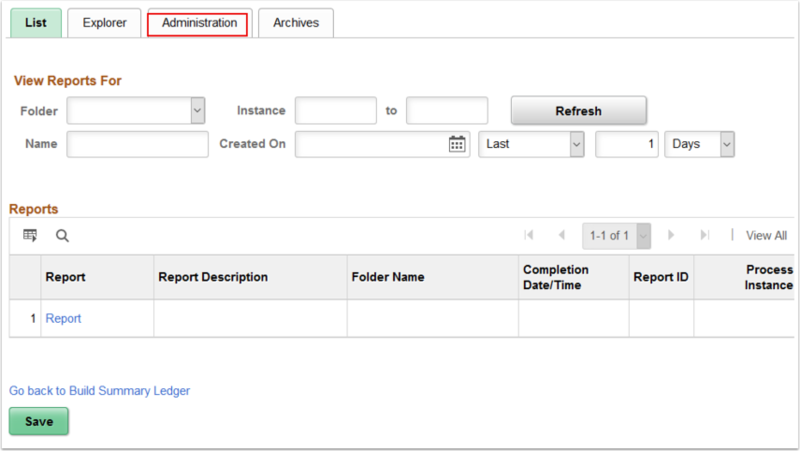 Enter an existing Run Control ID or click the Add a New Value tab on the Build Summary Ledger page to add a new value. 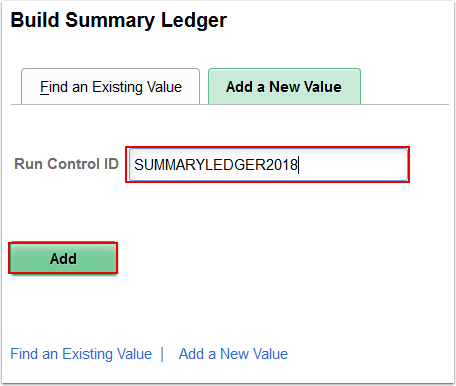 Enter a meaningful Run Control ID for the summary ledger in the Run Control ID field. The Build Summary Ledger Request page displays. Use it to define options, such as the fiscal year, period type, and effective date for processing summary ledger balances. Enter a brief description of the summary ledger(s) in the Description field. Select the Always radio button for the processing frequency. 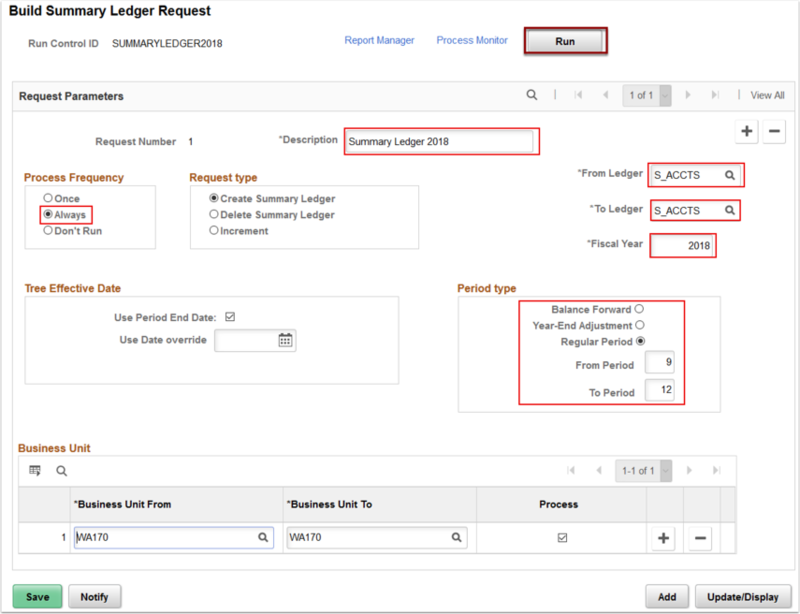 Use the From Ledger field to select or enter the beginning summary ledger of the range of ledgers that you want to process. 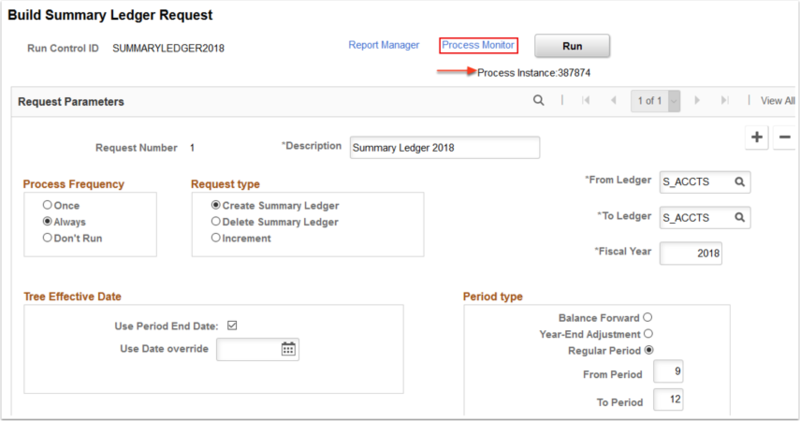 Use the To Ledger field to select or enter the ending summary ledger in the range of ledgers that you want to process. Enter the appropriate fiscal year into the Fiscal Year field. Balance Forward option after each annual close to prepare for the next year's processing. Year-End Adjustment option to summarize year-end adjustments. Period option to supply the range of periods that you want to summarize. The Process Scheduler Request page displays. Use it to enter or update parameters, such as server name and process output format. The Build Summary Ledger Request page displays. Click the Process Monitor link. The Process List page displays. Use it to view the status of the submitted process requests. Note: The process has finished successfully when the Run Status column indicates ‘Success’. Once the Run Status reaches ‘Success’, click the Go back to Build Summary Ledger button. The Build Summary Ledger Request page displays. Click the Report Manager link. The Report Manager page displays. Click the Administration tab. The Administration tab displays. 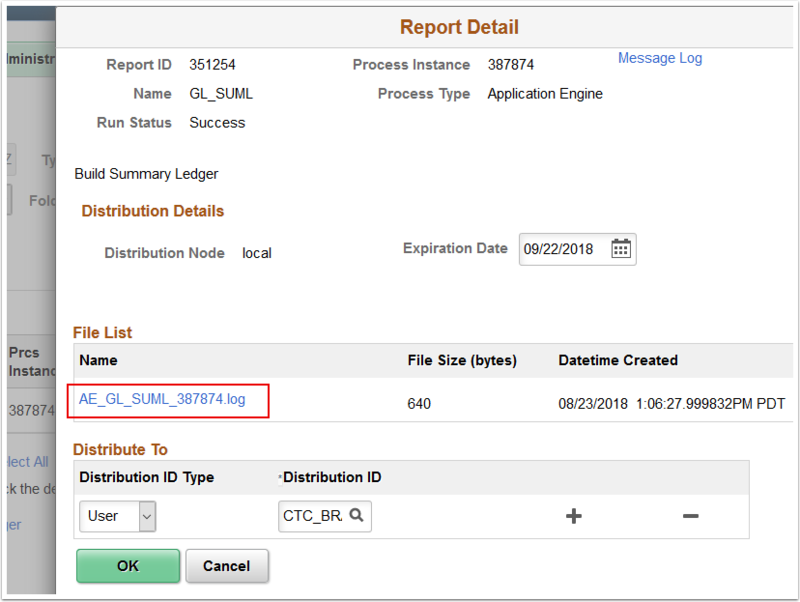 Click the report Description link to access the Build Summary Ledger report detail log. 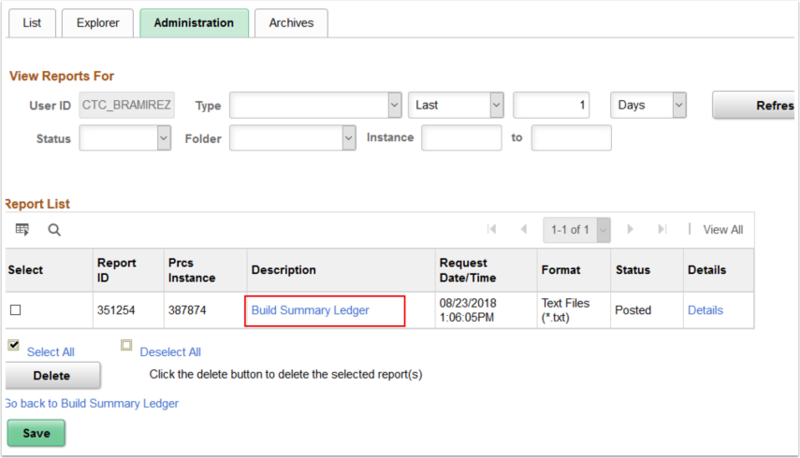 Click the Build Summary Ledger Report file name to launch the report results. Verify that the Summary Ledger(s) were processed.